A Business encouraging schools and community groups to grow their own vegetables has won a national award for innovation. Dig It Projects, which designs and installs allotment-style gardens for schools and community groups across the Tees Valley, was named Gooroo Innovative Business of the Year at the Startups Awards. The awards, which were organised by Startups.co.uk and held in London, were judged by some of the UK´s most successful entrepreneurs, including Toni Mascolo founder of Toni and Guy,and Julie Meyer, founder of Adrienne Capital. Dig It, based in Saltburn, east Cleveland, works with schools and community organisations, showing them how to grow their own fresh fruit and vegetables and delivering Growing Workshops to children and parents through after-school clubs. in addition, the company offers Lesson Plans that teachers can use in the classroom to enhance what they are doing outdoors in the garden, linking it to current curriculum targets and standards. Richard Smith founder of Dig It Projects, said "It feels unbelievable. We´ve had a good year, but to actually get recognised at a ceremony like this, winning an award, is great and gives the business a lot of cerdibility." "Now we can promote this award, which makes people look at you in a different light." "It´s Fantastic, not just for me, but for the staff. It recognises the good work we´ve done and gives us a big pat on the back. We´ve had a good year, we´re growing, it´s all been good and now we´re looking to next year." Dean Miles, head of business development at Gooroo.co.uk, the main sponsor of the awards, said "Dig It projects has shown that innovative ideas and flair will always win through." "We think they have what it takes to become a potential household name of the future." 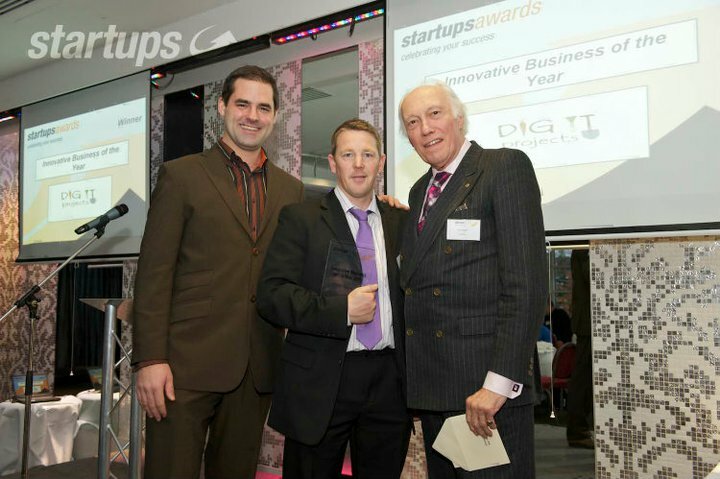 The Startups Awards took place at Kensington Roof Gardens in London. To be eligible to enter, businesses must have been trading for less than three years and be privately owned.